Cut the head of cauliflower into florets and place in large bowl. Lightly spray the florets with olive oil and sprinkle with sea salt to taste. Spread florets evenly onto baking sheet. You can line the baking sheet with parchment paper for easy clean up. 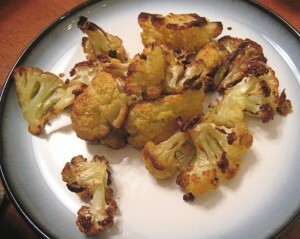 Bake at 425 degrees for one hour or until the cauliflower caramelizes, turning every 15 minutes. The more caramelization, the sweeter it tastes!